We all know the old phrase ‘Don’t judge a book by its cover,’ however we have to admit the cover or title of a book plays a large role in whether or not we pick it up and read it. The bright yellow cover and title of this month’s book jumped out at me from the conference table where I saw it. I knew I had to get this book and read it. 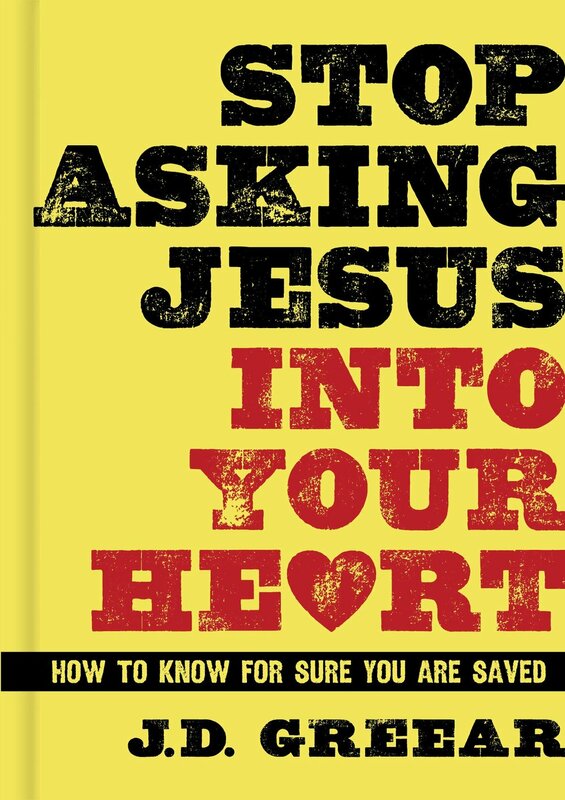 I had no idea who the author was and I had no idea whether or not the book was any good but the title got me: Stop Asking Jesus into Your Heart. As a pastor, this phrase has always piqued my interest. ‘Ask Jesus into Your Heart’ seems to be the modern day closer for any evangelistic message. You share the gospel with somebody, they seem interested, you tell them to ask Jesus into their heart. However, that phrase (or anything like it) is not found in the Bible. I guess it seems to be the way to tell an unchurched person “whoever will call upon the name of the Lord will be saved” (Rom 10:13; Joel 2:32). But what I have seen from people who ‘ask Jesus’ is that they have probably asked Jesus into their heart numerous times and they have done it with increasing earnestness. I remember one man saying, “I’ve accepted Jesus into my heart…and I really meant it.” At the heart of his concern was doubt or question over his salvation. Does our salvation depend on what we asked Jesus? Or, does our salvation depend on how much we really meant it when we asked? Or, does our salvation depend completely on the complete and finished work of Christ? If we depend on our prayer or our sincere intentions then our dependence is misplaced and will cause doubt and confusion. The subtitle of this book is “How to know for sure you are saved.” This is a book dealing with the doctrine of assurance. While the title of the book is meant to be a bit shocking and funny, the content is serious and Biblical. This is why we buy Christian books in the first place: to be edified and equipped to live the Christian life. We want books to help us with our various struggles and hardships that we are going through. We don’t pick up books just to see how two theologians are arguing with each other; we want edification! And edification happens when an author applies Biblical passages to the specific area and topic that we struggle with. To say that people struggle with assurance would be an understatement (see the example of the man I referred to earlier). I remember at our church in Long Beach there was an older woman who lived in fear of losing her salvation every day. To say one could know he has salvation was preposterous to her. But the Scripture tells us it is possible to know we have salvation (1 John 5:13). The author of this book knows how to teach us about assurance because he knows the Bible and he was one who struggled with assurance before. He admits to being baptized 4 times and asking Jesus into his heart hundreds of times. He jokingly admits to walking the aisle in probably every denomination! But the key is the Biblical understanding of faith, repentance, and the sacrifice of Christ. There is a chapter on each of those issues and very clearly and concisely he explains what each of those is and what they mean. There is a chapter on the ‘warning’ passages of Scripture and how they contribute to our assurance of salvation. There is also a chapter on looking for the fruit or evidence of salvation in your life. This book is simple and small but it is heavy and deep in the content with which it speaks. I believe there might be many people we know who struggle with the idea of assurance. Did I really pray the prayer right? Did I really mean it when I asked Jesus to come into my heart? And for those people we want them to have real assurance, not a false assurance that just says ‘I’m saved because I know I’m saved,’ but a real assurance that is based on them resting completely on the finished work of Christ alone and not on a recited saying. I endorse this book because the author takes a difficult topic and explains it in a way that all can understand. Pick up this book if you struggle with assurance and let’s be equipped in understanding assurance from the Biblical perspective.